Gone are the days when people would remain indoors during winter – that hassle trying to have as much as possible in the store for survival. Well, nowadays people find it fun to go for adventures during this season; be it snowshoeing, winter hiking, snowmobiling, ice climbing, winter mountaineering, sledding, snow shoveling and more. Others like farmers/ranchers will be busy in their fields despite the snow. What about those working on road projects in snow and sleet? Or those working in ski resorts? It’s all doable. The key lies in keeping yourself as warm as possible which starts with selecting the right footwear. In either case, the best snowmobile boots will do. Their magic is not just in keeping your foot dry, warm and comfortable but also in their capacity to protect your feet and ankles. Snow boots can improve your performance drastically when out in the snow. However, selecting just the right pair requires lots of research and comparison. No time for that? 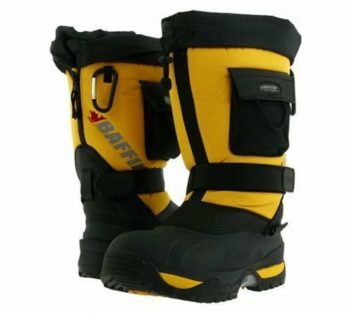 Don’t worry as in this write-up, we will give some guideline on what to consider while purchasing a pair of snowmobile boots and some of the top picks in the market today. Purchasing a pair of snowmobile boots may not seem like a tough decision. However, going an extra mile to understand a product that will help keep your feet comfortable, safe, and warm rather than thinking about your feet can be quite demanding. Moreover, the category of cold weather boots is very broad with drastic and subtle differences between models which call for a keen decision. In addition, it’s hard finding all your requirements in a single boot and thus you should try to strike a balance between various features based on your needs like a boot with many insulation layers might not be that breathable. However, you can buy it anyway if you’ll be participating in less active pursuits. Here are some of the factors you must consider before purchasing a snowmobile boot. This will be based on the temperature range you’re likely to experience during the adventure. As manufacturers base their temperature ratings on scientific testing, it’s likely you will find boots with cold weather extremes irrelevant to your needs. According to experts, pairs rated at -40 °F are ideal for any cold weather condition. It’s better though if you can go for a lower range than the temperature you’ll encounter outside. Most importantly consider the following factors: the temperature outside, your personal tolerance for cold, the length of time you’ll be outside, and how active you’ll be. Each of this will help you narrow down to a snow boot that best meets your needs. For example, when participating in activities like snowshoeing; your body tends to heat up fast which calls for a less warm boot. Also, if you normally have cold feet, purchasing advanced cold weather (-94 °F) snow boots can be ideal even if the ratings are much lower than what you might encounter. To keep cold at bay, the boots should have insulating materials that trap heat keeping your feet warm regardless of the weather condition. There are two types of insulation: neoprene and synthetic fiber insulation. The former is warmer, durable and do not pack out or loose insulating properties with time. In tight fitting garments, though, the material is less breathable. In addition, it’s not the warmest insulation in the market but it’s ideal for wet weather and moderate climates. Synthetic insulation is effective when allowed to ‘loft’ and expand. It feels softer than neoprene; however, synthetic insulation results in a looser fit with time. Other than the type, consider the amount and how the insulation is sewn into the boot. For example, a tightly packed insulation may feel quite as warm as in a boot with much less insulation but gives room for lofting. Keeping your pair’s interior dry is not only helpful in keeping your feet soggy but also warm as water conducts heat faster than air. To ensure their boots are waterproof, manufacturers make use of waterproof materials e.g. treated rubber or leather, or thin waterproof membrane like Gore Tex. While adopting inherently waterproof materials may forgo ventilation of the boot, making use of a membrane requires attention to the outer fabric too. This isbecause waterlogged outer materials may lower the breathability resulting in a cold/damp feeling. Most boots prove to be fully waterproof up to the tongue’s opening. It’s, therefore important to consider how high or low the cuff and the tongue openings are based on the depth of water you’re likely to encounter outside. During winter, sweating doesn’t really come into play unless you’ll be engaged in a very active activity like snowshoeing. In that case, a breathable boot may be required lest you have soggy toes. For breathability, go for snow boots made of Gore Tex membrane or any other material using similar technology. Note, there’s no point buying a -40 boot when the maximum cold is -20. Much as this will keep your feet toasty, sweating is bound to happen. Being in a snowmobile is totally different from playing in the snow the whole day. As you drive, your lower limb tends to remain stationary whilst lots of movement is confined to the arms and your torso. Bearing this in mind, go for boots that provide your feet with adequate shock protection and your ankle with forwarding flex. Snow boots will definitely be heavier than a pair of walking shoes, but there’s some variation and notable weight difference in various models. Some weigh as light as 2lbs and others go up to 5.5lbs. That couple pounds difference can be insignificant when snow shoveling for 25 minutes; but if you’ll be spending the entire day in your boots, lighter pairs will be your ideal choice. Nothing feels better than a pair of fitting snow boots. Consider trying a pair before purchasing if possible. If not, send your foot size, volume, length, and width to your seller. Experts recommend purchasing a boot ½ size larger than the norm for a proper fit. Remember it’s not just about the fit, consider the activity too. For example, a loose boot offers great comfort and warmth but is uncomfortable when it comes to walking for a long distance. However, tighter boots are comfortable to walk in for long distances but they result in circulation issues and cold feeling toes. You should, therefore, size your snow boots appropriately using the socks you will be using in the snow. Type of lacing system influences the fit and ease of use of a given pair. Boots with lots of lacing eyelets give room for a cozy fit but are hard to tightly lace up. Yes, they’re easy to tighten as it just requires a single pull, but result in a looser fit. Some models make use of speed lacing eyelets for a quick, secure fit with lacing hooks that allow you to customize the safety around the ankle. Such a system is highly customizable but labor intensive and difficult to use. Other boots make use of a quick-lacing system with a small toggle and a thin cord for easy and fast tightening. Go for a lacing system that will result in a comfortable fit with ease of use. It’s not just a matter of choosing a fun winter adventure, selecting just the right footwear is the real deal. Following the guidelines outlined above, you can be sure to have yourself a perfect snow boot. Just the right pair to keep your feet warm, dry, supported, protected with minimal weight. Whether you plan on going snowshoeing, winter hiking, snowmobiling, ice climbing, winter mountaineering, sledding or snow shoveling; there’s a snowmobile boot out there for you. Are you open to a recommendation? Here are the top snow boots (for men, teen, kids and unisex) worth trying. Best use: Endurance riding, mountain riding, snowmobiling, racing and boondocking. Don’t let the high price hinder you from acquiring this magical boot. It’s built to offer a good finish in rugged terrain while keeping you going fast, strong, dry and warm. Baffin Lightning Boot features a rubber insole with an arch support and a high-grip sole for maximum traction and support. Its removable 8-layer liner ensures maximum insulation keeping your feet warm while the waterproof upper layer fabric help keeps your feet dry and comfortable. The anatomical lacing system ensures a proper fit and ease of use when pulling the boot on and taking it off. In addition, the boot is suitable for a wide range of temperatures following its low-temperature ratings. Are you looking for a boot to take with you on your next boondocking activity regardless of the icy conditions? This comfy lightning snowmobile boot got you covered. Related: Looking for a boot with a multi-speed-lacing system with a polyester wool blend to boost their temperature regulation? Baffin Men’s Lighting Insulated Boot can be your ideal pick. The majority of customers recommend this boot. They all can’t be wrong, can they? A Baffin Endurance Snow Boot provides you with hefty weather protection for even the extreme wintry conditions. When out in the deep sleet and frigid temps, the snow boot keeps your feet cozy and Cush. Its aggressive rubber outsole deals with icy conditions and deep snow easily while the shock-absorbing midsole remains flexible in extreme cold. The 8-layer insulation lining retains heat keeping your feet warm while the seam-sealed construction ensures you remain dry and comfortable. Handy pockets provide storage forth or South Pole adventure? This boot got you covered. Related: Looking for a more affordable snow boot? 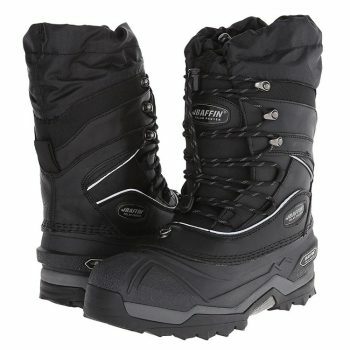 Baffin Men’s Selkirk Snow Boot can be your ideal choice. Snow Monster Boots are expensive but are sure to get what you pay for. Their construction takes in lots of knowledge and craftsmanship with the end result being a warm, comfortable and flexible boot. They are ready for arctic expeditions or trips to ice fishing huts. Icepaw pads on outsoles minimize the negatives of unplanned skating. 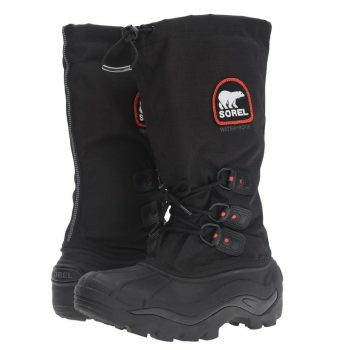 Their shells keep your feet soggy less and warm while the lace-up closure with top drawcords keeps snow out. In addition, their seam-sealed upper fabric help keeps your feet dry and warm. The boot just remains flexible in temperatures that normally would crack lesser footwear making it ideal when shoveling in Saskatoon. Related: If in need of a lighter boot with an adjustable circumference, Baffin Men’s Snow Monster Insulated All-Weather Boot is the ideal choice. Deep powders days require a Sorel Alpha Pac Boot. This snow boot is completely waterproof and its removable -60 °F liner keep your feet warm in icy conditions. Its lightweight upper, multi-directional lug outsole, and grippy base are designed to be flexible in frigid temps. Following its quality rugged materials, this boot can last for a lifetime. The built-in gaiters prevent snow from getting in while the Omni-heart liners make use of Aluminum dots on a ventilated membrane to reflect thermal mass back to your feet. Afraid of Canadian winters? Just slip in these boots for a fun walk in Winnipeg. 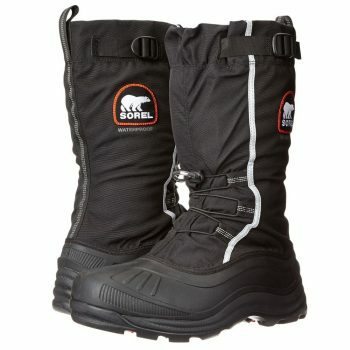 Related: Sorel Men’s Bear Extreme Snow Boot is the best alternative when looking for a more affordable pair that can handle even more rugged snow terrain. This Sorel Snow Boot is a good value for your money. It’s specially crafted to keep your feet warm and cozy. The waterproof upper fabric and Omni-heart reflective lining rated at -40 °F ensure you stay warm and dry all day long regardless of the weather condition. Their slip-resistant rubber sole improves your grip reducing any odds of slippage. Are you in an area where blizzards are common during winter? A Blizzard XT snow boot with a vulcanized shell for impact resistance and increased durability is just what an aged man ordered. Related: Sorel Men’s Glacier Extreme Snow Boot has a D-ring lacing system, adjustable drawstrings, and wind resistant PU-coated upper. It can be a better alternative if you’re in need of a lighter boot with a little bit of style. Much as some customers claim that the interior padding isn’t worth much of a praise, these Kamik Canuck Boot are ideal for any wintry condition. They provide excellent protection from weather elements. Their tall shaft, warm removable liner, and waterproof construction combine allowing you to enjoy your activities in dry and warm comfort. A breathable, thermal foil outer layer reflects heat back to your feet alleviating cold. Reinforced seams, heel patch and bidding boost their durability while removable Zylex liner provides impressive insulation alongside wicking perspiration off the boot. In addition, their drawstrings laces ensure a proper fit alongside making it easy to slip in and out of the boot. Their SNOWBOB rubber outsole is unbeatable when it comes to traction in rugged terrains. Related: Looking for a boot with a wider opening at a more affordable price? 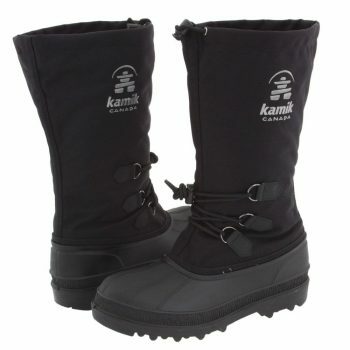 Kamik Men’s Greenbay 4 Cold-Weather Boot can be the right pick with a circumference of 20 inches. Do your kids follow you everywhere? These specialized Baffin Snow Boot will help them keep up with you while keeping them warm. Their Velcro closures at mid-leg and ankles ensure a secure fit while allowing for an easy removal. Plush multi-layer insulation provides extra warmth while the waterproof construction help keeps their feet soggy less and comfortable. Their thermoplastic lower shells and midsoles are lightweight and flexible regardless of the winter conditions. The rubber outsoles integrated with Icepaw padding provide impressive traction on slippery terrain boosting your kids’ safety and support. In addition, separate toggle closure help keeps snow out. Will you be trekking on snowy trails? Purchase Eiger boots for your kids and save your day. Related: In need of a more affordable pair? Baffin Snogoose Kid’s Insulated Boot can just be the right pick. There you have it! 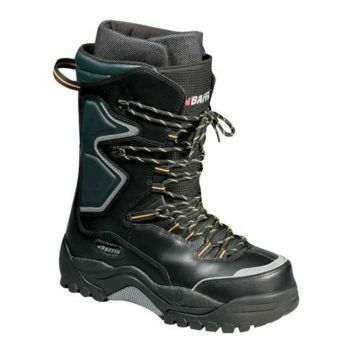 A list of the top-rated snowmobile boots. They’re the expert’s recommendation and thus you shouldn’t hesitate to try them out. In any case, you’re bound to find a pair that suits your needs and if not, you’ll have a clear guideline on how to go about selecting the perfect pair. Have you found your snowmobile boots yet? Remember that there will be a heavy layer of snow on your feet for the most part of the day regardless of your winter activity. Therefore you should select a boot that not only covers your feet but also one that provides the required protection, support, and warmth. Follow the tips outlined above for the right pick and if researching and comparing pairs is too much of a hassle, try the recommended pairs to ensure all the fun in the snow. Any other snowmobile boot that should have made it into the list? Sound off in the comments!